Keep your Air Purifiers running at maximum performance. This replacement filter unit is a combination filter that incorporates multiple layers of filtration, including a pre-filter, a charcoal filter and a True HEPA filter to help improve indoor air quality. The pre-filter removes large particles and hair. The True HEPA filter captures 99.97% of dust and allergens as small as 0.3 microns (dust, pet dander, mold spores, pollen, etc.). The charcoal filter reduces common odors from pets, smoking and cooking. Replace this filter every 6-9 months depending on air quality and frequency of use. Contains 1 filter unit. For use with the True HEPA Air Purifier (Item No. 204199) and the 4-In-1 Wi-Fi Air Cleaning System (Item No. 205354). 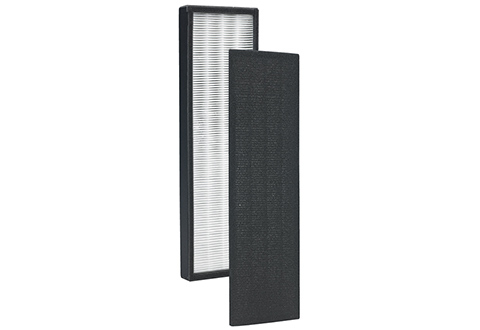 Keep your Air Purifiers running at maximum performance with this replacement filter unit.